Summary: A flash of white light . . . and then . . . nothing. My Thoughts: I really liked Derting’s other series! 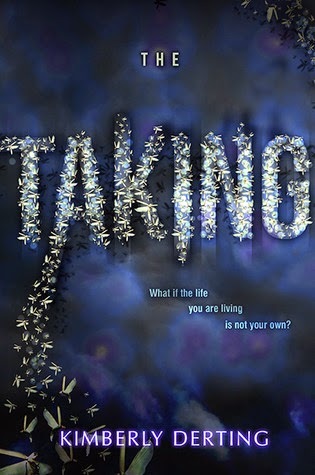 So I was excited to read her newest book, The Taking! We are introduced to Kyra who is a cheerleader, has the perfect family, nicest boyfriend, and a cool best friend. Her life is pretty good. Until she goes missing and then comes back a few years later. People have moved on without her. Yet, Kyra looks the same age and feels the same age. She also has no memory of where she has been. I was in for an rude awakening with this story! I thought for sure maybe she had been kidnapped and just returned and it was so traumatizing she just blocked out her memories. Boy was I wrong! As soon as she’s home, she realizes her family isn’t so great anymore. Things are not the same. Her boyfriend has also went away to college and lived the life they were supposed too together. She moves back into her old house and her boyfriends family is still across the street. Boy, has his little brother gotten hot. His name was Tyler and I really liked him a lot. I can tell he had a huge crush on Kyra when he was just a kid. But now he’s older and ready to make his move. I liked the things Tyler did. He was there for Kyra and I loved them sneaking out of the house to the park and the way he would draw on her sidewalk. Very very sweet. I also liked the angle this story took. It was weird the way she got taken and how things went down. I was surprised about that. I don’t want to tell you the main thing but I never really saw it coming. Didn't realize this was so scifi I guess. It all made sense eventually and things came together. I really liked the characters in this one and the plot. I thought it was unique and I was happy to meet Simon and everyone else. I liked their stories and hearing how things happened. And of course, things happen that are sad as well. And than the ending, now I want to know what happens! I can’t wait to read the next one! I have to know if things work out or not. Overall: Liked it. It was a bit weird at times but I still enjoyed it and am glad how things happened. I’m glad to know her dad had some logic to him as well. I’m also glad that Kyra did listen and take into consideration what had happened, at least after a while. I still really liked Tyler! Cover: Like it! Its kind of spooky but also love the blue!